Today, is my oldest daughter's birthday. She's all grown up with a life of her own. Very separate from mine and her dad's. Her life is on a different track; different from mine or what I would have wished for her. She only lives 4 miles from us so we see her almost every week; on facebook and texting phone to phone. I didn't have this much contact with my mother, times have defiantly changed. She is such a gift to us. I appreciate each and every moment I share with her. Happy Birthday sweetie-pie! Well, I'm back. Been gone for over a month. After I posted last month my husband and I took a physical drive down my memory lane. When my family came out here from Chicago (oh so many, many years ago) we lived in Riverside, CA. Since we weren't too far from my old neighborhood, we took a quick drive to see the middle school my brother and I attended and the high school my sister went to. We then drove over to see the house our family rented. Neighborhood looked somewhat the same. It was actually the last house we lived in as a whole family. My parents divorced a couple of years later. When we were leaving the street I wanted a photo of the street name sign. My husband pulled over, I got out of the car and stepped up onto the curb. Not looking where I was placing my feet I stepped off the curb and felt myself falling. I could see it all in slow-motion. I stretched out my arms to "catch" myself and only felt my smooth car and kept falling. My left arm was wrench back as I continued my forward fall. Felt my right arm hit the curb (long, bloody, scrape) on the way down. Somehow, both my arms came forward and prevented me from hitting my face on the street. Both shoulders hurt soooo bad. My right knee was scraped too, what a mess! I didn't hear any bones "pop" or "crack" so figured I was just bruised. We got me cleaned up and a cold pack on my left shoulder. I couldn't move my arm above my waist. Two days later I went back to work. The shoulder still wasn't working properly. I went to my Doctor, he suggested an X-ray, then a MRI came a week later. Make a long story short, my left shoulder is fractured. I'll be in a sling and off work for three weeks. 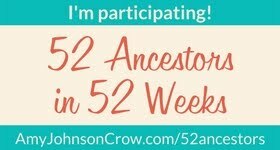 What a way to get caught up on some needed genealogy backlog.